Shreeji's filler masterbatch comprises of calcium carbonate, polymer raisin and other additive agents. These carefully chosen raw materials are processed using the latest technology to produce quality masterbatches. Filler masterbatch is widely used in the plastic industry, since it reduces dust formation, improves anti blocking properties, increases toughness and weaving ability. Not only this, it also helps to reduce the cost of production of plastic products. 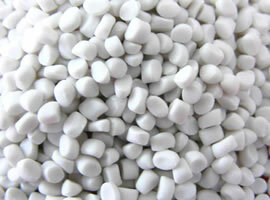 We are also offering Filler masterbatch Manufacturer in India. To cater to various client needs, Shreeji offers various grades of Masterbatches. We are offering Filler Masterbatches Supplier in Gujarat which are used in wide range of applications like: PP & HDPE woven bags, mono and multi layer films, blow moulding, injection moulding, PS sheets and many others. Shreeji's filler masterbatch is widely used in manufacturing HDPE woven bags, since its high loading capacity considerably reduces the cost of production. Compared to any other filler, it increases the production by more than 10%. Our masterbatch ensures quality, since powder formation is much lower compared to other filler options available in the market. Shreeji's filler masterbatches can be used in thick multi layer films. Our product contains techno STD compound, which not only reduces the cost but also maintains the shine and opaqueness of the film. Our masterbatches are widely used for manufacturing water and milk pouches , ghee packets and packaging material for various types of oils.